Sophomore Sydney Clayton preparing to get the rebound in the Rams matchup against Notre Dame College. (Photo Courtesy of Shepherd University Athletics). 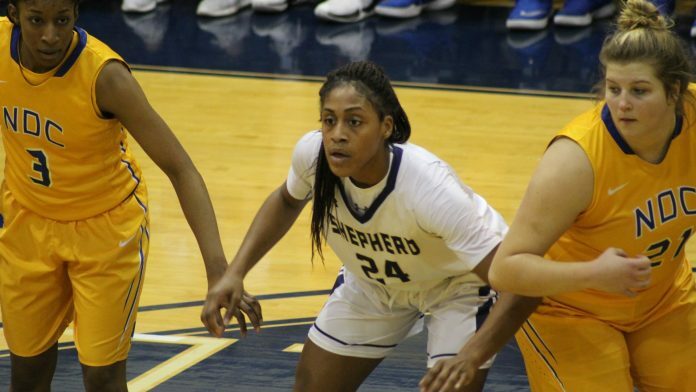 The Lady Rams(7-8, 4-5 MEC) were in for a dog fight in their matchup against Notre Dame College(8-7, 5-4 MEC), Thursday Jan 17, here in Shepherdstown. Senior guard Kari Lankford sealed the victory witth only 2.4 seconds left on the clock with a layup, giving the Rams an 82-81 victory. Shepherd knew going in to the game that Notre Dame was going to be a tough matchup, as the Falcons finsihed second in the MEC last year, with many players from that team returning. It was going to take more than one standout player’s performance to win this game. Senior Kayla Tibbs led the team in scoring with 24 points, and hit crucial three pointers to keep Shepherd in the game. Tibbs went 5-9 from the three point line, and 7-16 from the floor. Shepherd shot well as a team, shooting 51 percent from the floor and 56 percent from behind the three point line. Anytime your team is shooting over 50 percent from the three point line, you have a great chance of winning. In the first half Shepherd controlled the lead throughout, but the Falcons kept them on their toes as they trailed behind closly. The Rams continued to knock down shot after shot, from both the inside and out, forcing the Falcons to play them honest. Sophomore Sydney Clayton, continued her sucess as she added 21 points and seven rebounds. Clayton has not only developed her post game but, also has took defenders to the basket off the dribble, which add’s another threat for opposing teams. The lead changed 15 times in the second half, as both teams went back and fourth giving each other buckets. Notre Dame scored multiple times from a person being open cutting to the basket. Then Shepherd would come back and knock down a three. “The best thing about it is whether it was offense or defense, we had different people step up… players made plays…” Head Coach Jenna Eckleberry said. It was a great team victory over a tough opponent. With Shepherd up 80-77, with one minute left remaining they got another open layup from Tamia Ridley, and then a jumper by Kyliegh Ramblow with just seven seconds left in the game. Just when you thought it was over Lankford inbounds the ball at the top of the key, head fakes and drives to the basket throwing up a layup over another defender. The ball hit off the backboard before going in, sending everone in the Butcher Center in a uproar. The Rams look to steal another victory this Saturday against Urbana University, here in Shepherdstown at 2 p.m.